Have you ever sat in an empty Chinese restaurant on Christmas day feeling like you are the only person in the whole country not congregating around a tree? For those who keep kosher, resisting the temptation to order shrimp for their fried rice sometimes seems like just one more thing that sets Jews apart. Sometimes, one can’t help but wonder: What’s the point? This question comes into starker light when considering that traditional kashrut inadequately addresses contemporary ethical issues of the gastronomic variety. For example, if you type ‘agriprocessors’ into Google, you will be bombarded with information about the ethical misconduct of one of America’s biggest kosher meat producers, including cruel animal abuse, refusal to recognize its workers’ union, questionable environmental behavior and charges for breaching child labour laws. How can these practices in good conscience be considered “Kosher”? ‘Kashrut’ comes from the Hebrew root meaning “fit” or “proper,” and denotes guidelines for appropriate eating and consumption. The animal being consumed must be slaughtered in a way that ensures little physical discomfort for the animal. An animal must not be eaten with its mother’s milk, to signify the separation between its death and its source of life. A mother and child animal must not be killed on the same day. All of these rules, and others, are intended to create a social, ethical consciousness surrounding the food we eat, as well as promote a spiritual relationship to food. But are these rules enough to ensure an ethical food industry? The limitations of traditional kashrut have sparked critical analysis of the dietary laws. Proponents of kashrut reform advocate for changes in the standards of kashrut to follow suit with the changing food industry and the new ethical dilemmas its presents. A simple hechsher (the symbol of kashrut certification) no longer seems to be enough to ensure ethical food. At the forefront of addressing these questions stands the Eco-kashrut movement, which emphasizes the environmental impact of the globalized food industry, which values efficient mass production over environmental consciousness. Advocates of eco-kashrut encourage environmental and animal-friendly ideas about food, such as organic farming, free-range livestock and sustainability, as a contemporary means to maintain an ethical conscious. Eco-kashrut also connotes a lifestyle outside of the realm of food, providing commentary on the environmental and spiritual implications of issues such as plastic production, energy consumption and general sustainability. With Hanukkah just around the corner, the Shalom Centre’s Green Menorah Project provides an interesting example of the key role environmentalism plays in the holiday. Spiritually speaking, eating with an ethical understanding can unite food consumption with nature and God. The Conservative Movement of Judaism has gone so far as to develop its own eco-kosher hechser, called a hechsher tzedek (justice certificate), to supplement traditional kosher standards. Other initiatives to create “social hechshers,” which denote just worker-producer relations among other socially responsible considerations include Tav Chevrati, created by Bema’aglei Tzedek, and Magen Tzedek’s initiative to label food that is conscious of environmental implications, animal welfare, and labour relations. So the next time you scan a package of meat for a hechsher, maybe think about all the other aspects of production that are not considered in the traditional kashrut certification process. After all, if kashrut is intended to provide an ethical guidance, it might as well be relevant to the ethical questions of today’s times. Here’s another great Hanukkah recipe. Jews of Spanish origin developed bumuelos or buñuelos—fritters or pancakes fried in olive oil and dipped in honey or sugar syrup or sprinkled with cinnamon and sugar—as sweet Hanukkah treats. Here’s a modern take on the Sephardi classic! Read more on the history of Hanukkah foods in Moment‘s latest “Talk of the Table” here! Prepare the Red Wine sauce first: Mix the ingredients together in a small saucepan and bring to a boil. Lower heat and cook for 10-15 minutes, stirring occasionally until the syrup thickens to the consistency of honey. Keep warm. (Overcooking the sauce will make it harden). Set aside. In a medium saucepan, bring the water, butter, sugar and salt to a boil and set aside. Place the flour in the bowl of a mixer. Turn the mixer on low speed and add the boiling liquid mixture. Continue mixing on low speed until a soft dough is formed that leaves the side of the bowl. Add the eggs one at a time, mixing well after each addition. Heat 1½” canola oil in a wide pan. Line a plate with paper towels. Using a medium ice cream scoop or two tablespoons, form a ball of the mixture and slip into the hot oil. If the ball is difficult to form, beat in an additional tablespoon or two of flour. Fry 4-5 balls at a time on medium-high heat till golden brown. Remove with a slotted spoon and place on the paper toweling to remove excess oil. Sprinkle with powdered sugar. Reheat the wine sauce over low heat until very warm. Pour 3 tablespoons of sauce on each serving plate. Set 2-3 bumuelos on top and serve. Friday evening, nearly 3,000 people packed themselves in to the Roy Thompson Hall in Toronto, Canada to witness former-British Prime Minister Tony Blair and author Christopher Hitchens grapple with the merits of religion. The event was part of the Munk Debate series, organized by the Aurea Foundation, for which the prompt was simply: “Be it resolved, religion is a force for good in the world.” Blair–a recent convert to the Roman Catholic Church – was tasked with defending the necessity of faith communities, while Hitchens–author of the best-seller God is Not Great–argued that religion is the source of incalculable misery throughout human history. 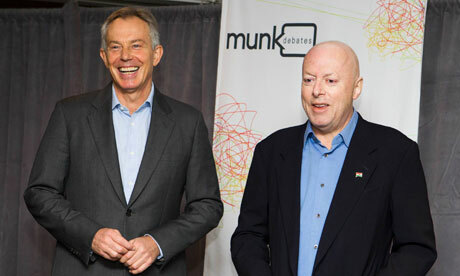 During the 90-minute debate, Hitchens seemed to hold sway over the crowd although a pre-debate poll showed 57% of the audience already agreed with his position, compared to the 22% who were sympathetic with Blair. The remaining participants were undecided. That this debate occurred Friday evening is apropos of a similar discussion within the Jewish community, as each Shabbat we are asked to make a conscious decision about what it means to be a Jew. On one hand, Judaism is a matter of faith affirmed by the commandments of shamor v’zachor, to keep and remember, the Sabbath. On the other, it is a cultural heritage that extends beyond the synagogue–if it includes it at all. As Jews we ask ourselves if Judaism as religion is “a force for good” in our lives, in our communities, and the world at large. Unfortunately, elements of faith have been used through our history for oppression; consequently, it may not be surprising that traditionally subjugated minorities–women and the LGBT community, for example–have found greater degrees of mobility within those denominations of Judaism that have moved further away from strict observance. At the same time, there have been countless Jews who have contributed to the betterment of our communities – looking at the Forward 50 published earlier this year, we can see contemporary examples of fellow Jews who have taken leadership on a variety of issues. Yet contrary to Blair’s characterization of do-gooders their individual relationship to Judaism is not necessarily one of faith, even as this heritage may have inspired them toward a certain moral imperative. In this way, the religious element may not be necessary for the performing of good deeds. At the same time, there are many on the list that have an intimate relationship with Judaism as a faith practice. For them, it’s an inextricable part of their Jewish identity. Then is it possible to separate Judaism as faith from Judaism as cultural heritage? I recently had the opportunity to sit down with Rabbi Adam Chalom of Congregation Kol Chadash, a growing Humanistic community north of Chicago proper. He explained that the purpose of Humanistic Judaism is to honor Jewish culture in a way that is human-centered; it is a space for the secular Jew to celebrate his or her heritage, while “saying what they believe, and believing what they say.” In some cases, that may mean removing G-d from the equation. On the other hand, as a Jew-by-choice my approach to Judaism is one defined almost exclusively by faith; unlike Rabbi Chalom, I lack the cultural heritage of a born-Jew. Yet through our conversation, it was evident that we shared one key belief: Judaism can be “a force for good in the world.” It is true that our tradition – inherited or chosen–has been used to maintain systems of oppression. Yet it has also served, and continues to serve, as a source of inspiration for the betterment of mankind, for both secular and observant Jews alike. Scrub the sweet potatoes, peel and shred them on the fine side of a grater or in the food processor. Transfer to a wire-mesh strainer and squeeze to remove moisture. Let stand in the strainer or a colander placed over a bowl for 5 minutes. In a medium bowl, beat the eggs with a fork and add the matzah meal, sweet potato, salt and pepper. Let stand an additional 5-10 minutes. In the meantime, prepare the sauce: In a small pan combine the ingredients for the sauce, heat over low heat and keep warm. Heat 2 tablespoons oil in a large skillet and add a small ladleful of the batter. Flatten gently and fry on both sides till golden-brown. Add more oil to the pan as necessary, and fry the remaining latkes. Place the latkes on a paper towel-lined plate to absorb excess oil. Pour some of the heated sauce on individual plates and arrange three latkes on top per serving, or use a serving platter and pass the sauce separately. Garnish with fresh coriander or mint. Serve with sour cream or plain yogurt if desired. Last week a group of twenty cantors from the American Conference of Cantors (ACC) serenaded Catholic officials in Rome with rousing renditions of Adon Olam and other Jewish liturgical melodies. The concert was a part of the Interfaith Information Center’s conference on Catholic-Jewish relations. Monsignor Renzo Giuliano, priest of the Basilica of Santa Maria degli Angeli e dei Martiri, said it was “very important to be here [at the concert] together and praising our god.” While Jewish-Catholic relations have been steadily improving for decades, a new Catholic push to mend ties with Muslims is pushing the Church’s Jewish priority to second place. For thousands of years Catholic Jewish relations were marked by antagonism and contempt. For centuries, central tenants of Catholic doctrine included Supercessionism, the belief God rejected Jews and anointed Christians as his chosen people, and Translated Responsibility, which holds Jews accountable for Jesus’ death. From the medieval era until the 19th century, the Catholic Church endorsed an array of discriminatory proposals against Jewish residents. Catholics’ relations with their other monotheistic peer, Muslims, were marked by similar confrontational episodes. When Islam emerged in the eighth century, Catholic scholars were quick to pronounce the new doctrine as heresy. Catholics’ initial dismissal of Muslim doctrine foreshadowed the bloody Catholic crusades against Muslim rule of Palestine in the medieval era. By the early 1960s the Vatican grew tired of having frayed relations with other religious groups and reformulated their millennia old interfaith policy. In 1965 the Church issued Nostra Aetate, their seminal document on interfaith relations. Nostra was the first time the Vatican advocated for interfaith dialogue between Catholics and other religions. One of the Vatican’s primary objectives with Nostra was to rekindle its relationship with Jews. It is no coincidence that the section of Nostra discussing Jewish relations is the longest. Nostra renounced charges of Jewish deicide, acknowledged Jews’ covenant with God and decried anti-Semitism. Some Church officials challenged Nostra’s detailed discussion of Jewish relations and were joined by Arab countries in protest. However, the Vatican’s insistence on redefining Catholic-Jewish relations cemented the section discussing Judaism. In the 45 years since Nostra Aetate Catholic-Jewish relations have remained stable. The Church has issued a series of documents on Jewish-Catholic relations ranging from 1975’s Guidelines and Suggestions for Implementing the Conciliar Declaration Nostra Aetate (No. 4) to 1998’s We Remember: A Reflection on the Shoah. Three popes have visited Israel since 1964, with Pope Benedict XVI making the most recent visit in May 2009. But all that may be changing. According to National Catholic Reporter John L. Allen Jr., dialogue with Muslims is now the Vatican’s most important interfaith priority, perhaps displacing the importance of the Jewish-Catholic relationships. The bulging global Muslim population, increasing Catholic presence in Muslim countries in Africa and the Middle East are some of the major factors fueling the detente. One of the main priorities of the Catholic-Muslim interfaith effort is securing freedom of religion for Catholic minorities in Muslim dominated countries. The Vatican would like to see the religious freedom enjoyed by Muslims in the West extended to Catholic minorities in countries with large Muslim populations. For example, Pope Benedict has maintained steadfast support for Asia Bibi, a jailed Pakistani Christian who faces death for criticizing the Islamic prophet Mohammed. The prioritization of Muslim relations has ushered in a change in the Vatican’s demeanor towards its Jewish relations. Whereas the Vatican consistently sought to apologize for past grievances against Jews when Jewish interfaith relations were the priority, now Catholics no longer worry about critiquing their Jewish peers or voicing their displeasure. For example, Pope Benedict XVI’s recent praise of Pope Pius XII has upset Jewish Holocaust survivors, as many believe Pope Pius could have done more to rescue Jews from the Nazi regime. But Allen states that the Vatican’s Muslim interfaith efforts are redefining its interfaith relationships in a broader way. Catholic interfaith efforts have moved from “interreligious dialogue” to “intercultural dialogue” which emphasizes shared understanding of cultural issues such as religion’s role in civic life and eliminating poverty. Hopefully, the Church can avoid the trap of swapping out good Jewish relations for good Muslim relations by focusing on the important cultural and humanitarian issues important to all three monotheistic faiths. On the one hand, these students are courageous, passionate, and strong young Jews, who possess an ability to take a stance in a way that many wouldn’t have the chutzpah to. Yet, their actions, and especially the responses to them, beg the question of what, if anything, their activism accomplished. Let’s take a minute to reflect on different avenues of Jewish activism. There are numerous Jewish groups in the USA and Canada dedicated to national inequalities, such as Jews for Economic and Racial Justice. Other Jewish organizations, such as the American Jewish World Service, are committed to combating global inequalities, most often in underdeveloped countries. These kinds of groups, which believe their activism is Jewishly-inspired or mandated, focus on social activism and are dedicated toward increasing people’s equality and freedom, either on a national or international level. Given that activism is often politically-based, it could be argued that political lobby groups, such as AIPAC and JStreet are also organizations of Jewish activism. Their work is dedicated toward promoting certain values in policy. Such work seems to be the most tangible type of activism, as it tends to produce real, concrete results (like a political policy). However, the productive nature of this work does not necessarily imply social changes or affect people’s attitudes. This brings us back to those five protesters, who neither build anything or create policy, per se, but vie purely for social change. When watching the video, it is obvious that the crowd around them is unimpressed by the student’s disruptions. In fact, the more they protest the more aggressive and angry the crowd becomes. The students hoped to promote alternative viewpoints to Netanyahu’s presentation in a space in which they felt shut out. Compare these goals to the results of their activism, and the outcomes are disheartening. Aiming to encourage a critical perspective on Israel, the protestors in fact reinforced a vehement support for Netanyahu (and by extension, a singular perspective on Israel). Instead of recognizing the legitimacy of the student’s voices, and their presence at a Jewish Assembly (supposedly representative of all Jews), the protest just made people angry. This anger can do nothing else but fuel more resentment towards the student’s message. The attempt to deconstruct Netanyahu’s argument, may in fact, have reinforced it (or at least turned people off from the new argument). While the protest ultimately failed in its goal of contributing a different Jewish perspective to the debate, it did accomplish one thing. It shattered the perceived unity of the Jewish people and made clear that there was not only one perspective on Israel, which seems to be the dominant idea at the conference. In that, at least, it inched toward the change in social attitudes.